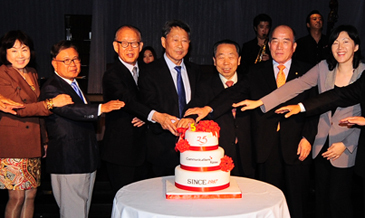 CK President Kim Kyong-Hae (center) cuts the cake with VIP guests in a reception held at a Seoul hotel on Sept. 26, 2012 to celebrate CK's 25th anniversary. A reception to mark the 25th anniversary of Communications Korea (CK) was held at the Imperial Hotel in southern Seoul on Sept. 26, 2012. On hand at “the friendly get together” were 100 plus friends and well-wishers of Mr. Kim Kyong-hae, who founded the country’s first PR agency in 1987 and has since extended quality PR services to global clients namely Boeing, General Dynamics and GM to name just a few, "We''re incredibly excited to celebrate our 25th anniversary with friends, family and advocates," said Kim paying a tribute to a group of exceptional individuals who have been a vital part of CK family and advocates in its formative years. Among participants included Mr. Chang Man-key, chairman of the Korea Human Development Institute and Ms. Sohn Jiae who recollected her early days with CK in her touching speech during the gala. CK President Kim Kyong-Hae (left) poses with PR Officer Phil Doe of the German Embassy in Seoul. More recently, she wrapped up her 18-year career as a journalist and took up the role of president and CEO of Arirang TV. This followed a brief stint as the spokeswoman for a Korea-hosted G20 Summit, a role she reprised to promote international public relations at the presidential residence of Cheong Wa Dae. Ms. Sohn is known for her impeccable English as demonstrated through her years of live broadcasts on CNN. She learned the language while living in the U.S. for four years as a child. She moved there as a second-grade student when her father was posted to work at the Korean Embassy in Washington D.C. Selected congratulatory messages with video clips sent by friends of Mr, Kim from the United States and elsewhere in the world were also introduced to audience through video screen during the gala which continued through late in the evening in cozy atmosphere. They included Pilar Laguana, marketing manager of Guam Visitors Bureau, John Gallaher, international director of EMG and Ray Eglington, president, Four Communications in Europe and Middle East. Kim has previously served as Seoul correspondent of Reuters News Agency and economic editor of the Korea Herald. In 1983, he founded Korea’s first English-language business magazine, Business Korea. He has been involved with journalism for more than 20 years after graduating with a degree in English literature from Sogang University, in Seoul. 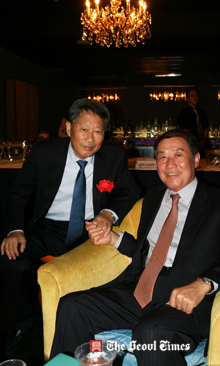 Mr. Kim, APR, founded Communications Korea in 1987. Mr. Kim’s extensive background in journalism played a key role in enabling him to become one of the key figures who has helped to shape Korea’s public relations industry. He also served as the president of the Korea Public Relations Association (KPRA) in 1991 and 1992, and received “The PR Man of the Year” award in 1994. In 1999, the Korean government bestowed upon Mr. Kim a presidential citation for his contributions for integrating private sector PR techniques with government PR efforts.